PDF Unlocker tool easily removes all restrictions from PDF file, after removing all restrictions users can easily work with PDF file and users can edit, print, and copy the text in it. The software allows user to remove restriction from multiple PDF files. 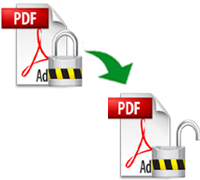 The application can easily remove owner level password from protected PDF file. Remove PDF restrictions: Copying, Editing, and Printing. Support Adobe Acrobat 9 and all lower versions. Adobe Acrobat installation is not necessary. Supports Windows 8.1, 8.0, 7, and all below versions. Does not remove the restrictions from corrupt PDF file. After processing completed, Provides option user can save PDF file any desired location. Generate instant preview of PDF file. A person may fail to access his old protected PDF file because of losing / forgetting the password. In this case, the only solution is to recover the password by hit & trial method. In an organization, a password protected PDF file saved by an ex-employee needs to be accessed and the only way to do so is by having the password. In case the password is not known, the PDF file cannot be opened. If a person got an email with an attached PDF file but is, unable to modify its content, in this case he has to remove the restriction applied on it. To access and modify the password protected and restricted files, a need arise to use some third-party tools available on the web. One of them is described as that allows you to Remove Password Protected PDF Restriction by using PDF Unlocker Tool. The password-protected files can also be viewed with original formatting along with their properties. It also provides a facility to save the recovered file for further use. What does PDF Unlocker software? The software can removes owner level password from protected PDF file and removes restrictions like printing, editing, copying text. The trial version of software does all these tasks? The trial version of product removes all restrictions from PDF file. But, you want to save them, you can get “company name” watermark on all PDF pages. The PDF Unlocker software can support Windows Operating System. Yes, the software support Windows 8, 8.1 and all previous versions.